The first rule of opening a new restaurant, new is not always better. New restaurant equipment is shiny and pretty, but not a necessity. You can buy purchase quality used good quality restaurant equipment for pennies on the dollar. Expensive items, like ovens, grills, and refrigeration units are also good candidates for buying second-hand. There are some pieces of restaurant equipment that are better off buying new. Leasing equipment is another option that can save money as you get ready to open a new restaurant. Equipment with short life spans, like ice machines, are perfect for a monthly lease. Vendors also offer leased equipment, like coffee makers and coolers, for free, so long as you buy their products. 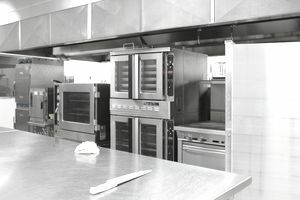 A restaurant kitchen requires a wide array of equipment, often in a small, cramped or otherwise awkward space. Therefore, restaurant kitchen requires careful planning, to maximize space and promote efficiency. A typical restaurant kitchen is composed of different stations and restaurant equipment. A station is an area where a certain type of food is prepared. Stations help keep a restaurant kitchen running smoothly. An integral part of restaurant equipment in the kitchen is the refrigeration systems. Restaurant refrigeration ranges from small coolers (like a dorm fridge) to massive walk-in refrigerators and freezers, and everything in between. Like the kitchen, you can save a lot of money by outfitting your restaurant dining room in second-hand equipment. Tables and chairs represent a big expense when opening a new restaurant. The reason they are so expensive is that they are made to withstand the rigors of daily use in a busy restaurant. The same is true of restaurant dishes, which are not the same as your kitchen dishes. Restaurant dishes aren’t cheap, compared to those you can buy at Wal-Mart or K-Mart, but like commercial grade tables and chairs, they are made to withstand the rigors of a commercial kitchen dishwasher. Smaller items like salt and pepper shakers, bread baskets, and flatware are all ideal for purchases used. The set-up of a restaurant bar depends on your restaurant’s size, theme, and liquor license. Some bars are service only, meaning it does not serve customers directly; it is just for staff to order drinks. Much of the equipment for a restaurant bar is small, like mixers, shakers, glasses, and such. The big-ticket items like beer lines, coolers, and tap head are where you will spend the most money. Many items for your bar you can get for free from distributors, like pint glasses, coasters and napkin holders. Both on and off-premise catering offers restaurants a chance to expand the business beyond their dining room. Just like running a restaurant, catering outside of a restaurant requires a lot of attention to detail and organization, as well as select pieces of equipment. While your restaurant may have much of the equipment needed for catering, like plates, glasses, and flatware, there are certain pieces of commercial equipment needed to serve food safety and efficiently at catered events.